MOBERLY - The Moberly Police Department is urging residents to check their credit and debit card statements for charges they did not authorize. The department got reports of numerous fraudulent credit card transactions being reported to Moberly and Columbia banks Tuesday. Many of the reported fraudulent transactions occurred from late December through late January. Police Chief Troy Link said people who find a fraudulent transaction on their statement should immediately contact their bank, complete all the proper paperwork and report to the police if they want further investigation. "The two important things people should do are, number one, regularly monitor their credit card statements. They should also make sure that the charges that are on the statements are accurate." said the regional director of the Better Business Bureau, Michelle Gleba. "Second, once a year, to obtain a free copy of their credit report." 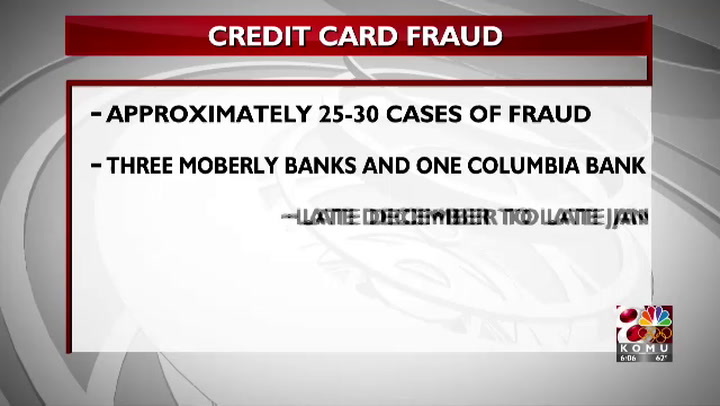 Three banks in Moberly and one bank in Columbia have reported approximately 25-30 cases of fraud within the past month. Link said the investigation is still in the preliminary stages. Anyone with information should contact the Moberly Police Department or the Randolph County TIPS hotline at 660-269-8477.